Welcome to the Archives Unleashed Toolkit hands-on walkthrough! The reality of any hands-on workshop is that things will break. We’ve tried our best to provide a robust environment that can let you walk through the basics of the Archives Unleashed Toolkit alongside us. If you have any questions, let Nick Ruest or Ian Milligan know. People, Places, and Things! Entities Ahoy! This lesson requires that you install Docker. We have instructions on how to install Docker here. 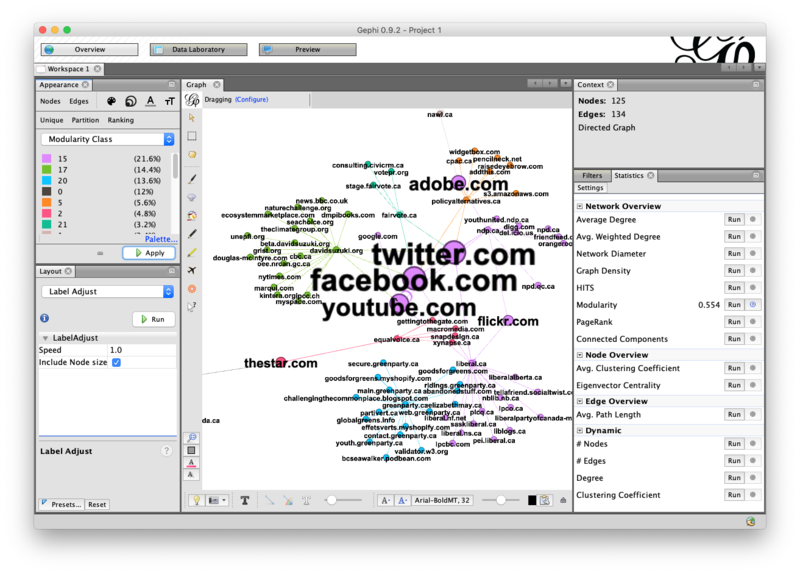 Later in this lesson, we use the networking tool Gephi. Make sure that Docker is running! If it isn’t you might see an error like docker: Cannot connect to the Docker daemon at unix:///var/run/docker.sock. Is the docker daemon running? 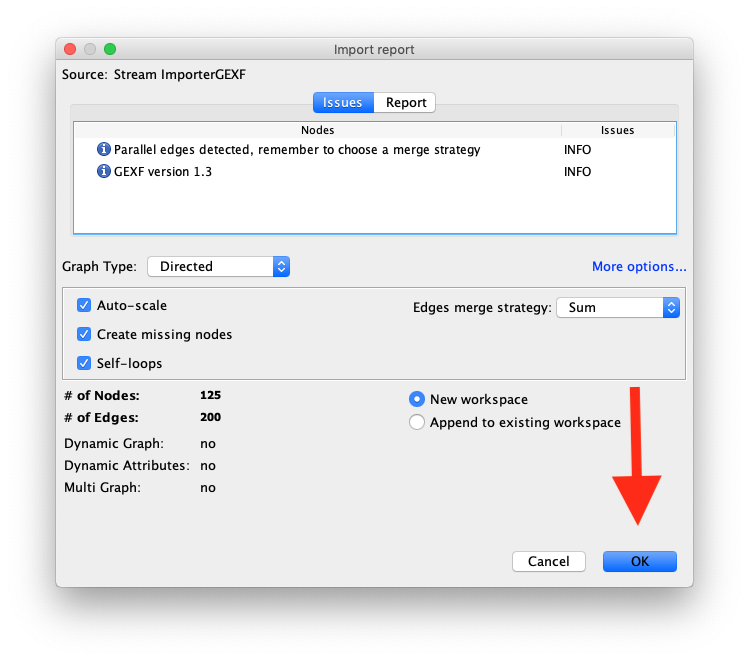 – make sure to run it (on Mac, for example, you need to run the Docker application itself). Make a directory in your userspace, somewhere where you can find it: on your desktop, perhaps. Call it data. In my case, I will create it on my desktop and it will have a path like /Users/ianmilligan1/desktop/data. 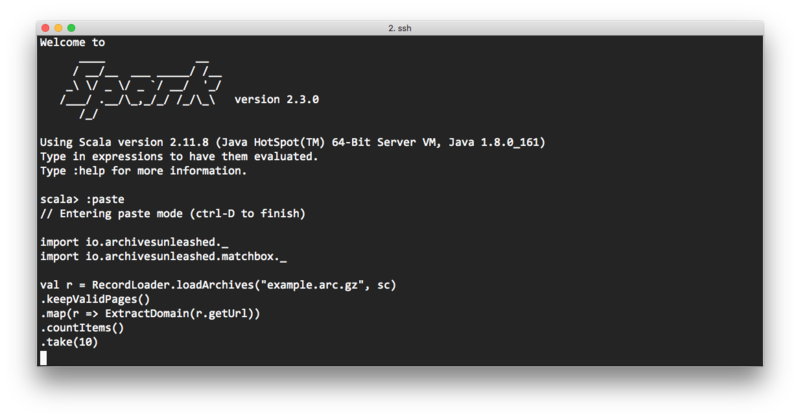 Use the following command, replacing /path/to/your/data with the directory. If you want to use your own ARC or WARC files, please put them in this directory. The above commands are important, as they make the rest of the lesson possible! Also, if you are using Windows, you will need to provide the path as it appears in your file system. For example: C:\Users\ianmilligan1\data. Now that we are at the prompt, let’s get used to running commands. The easiest way to use the Spark Shell is to copy and paste scripts that you’ve written somewhere else in. Fortunately, the Spark Shell supports this functionality! At the scala> prompt, type the following command and press enter. and display the top ten! Once it is pasted in, let’s run it. You run pasted scripts by holding the Ctrl key and the D key at the same time. Try that now. and it tells us what we can expect to find in the web archives! In this case, we have a lot of the Liberal Party of Canada, Equal Voice Canada, and the Green Party of Canada. If you loaded your own data above, you can access that directory by substituting the directory in the loadArchives command. Try it again! Remeber to type :paste, paste the following command in, and then ctrl + D to execute. Now that we know what we might find in a web archive, let us try extracting some text. You might want to get just the text of a given website or domain, for example. 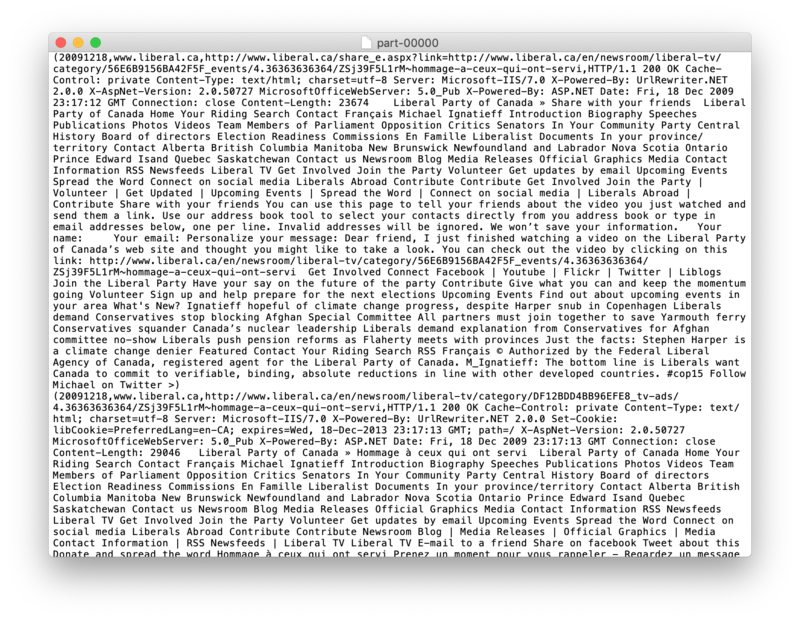 Above we learned that the Liberal Party of Canada’s website has 1,968 captures in the sample files we provided. Let’s try to just extract that text. To load this script, remember: type paste, copy-and-paste it into the shell, and then hold ctrl and D at the same time. If you’re using your own data, that’s why the domain count was key! Swap out the “liberal.ca” command above with the domain that you want to look at from your own data. One of the vexing parts of this interface is that it creates output directories – and if the directory already exists, it comes tumbling down. As this is one of the most common errors, let’s see it and then learn how to get around it. Try running the exact same script that you did above. Change the name of the output file - to /data/liberal-party-text-2 for example. Take some time to explore the various options and variables that you can swap in and around the .keepDomains line. Check out the documentation for some ideas. Filter by Language: What if you just want French-language pages? After .keepDomains add a new line: .keepLanguages(Set("fr")). Finally, if we want to remove the HTTP headers – let’s say if we want to create some nice word clouds – we can add a final command: RemoveHttpHeader. You could now try uploading one of the plain text files using a website like Voyant Tools. People, Places, and Things: Entities Ahoy! One last thing we can do with text is to try to use Named-entity recognition (NER) to try to find people, organizations, and locations within the text. To do this, we need to have a classifier - luckily, we have included an English-language one from the Stanford NER project in this Docker image! This will take a fair amount of time, even on a small amount of data. It is very computationally intensive! I often use it as an excuse to go make a cup of coffee. Here we can see that in this website, it was probably taking about Sault Ste. Marie, Ontario. One other thing we can do is a network analysis. By now you are probably getting good at running code. 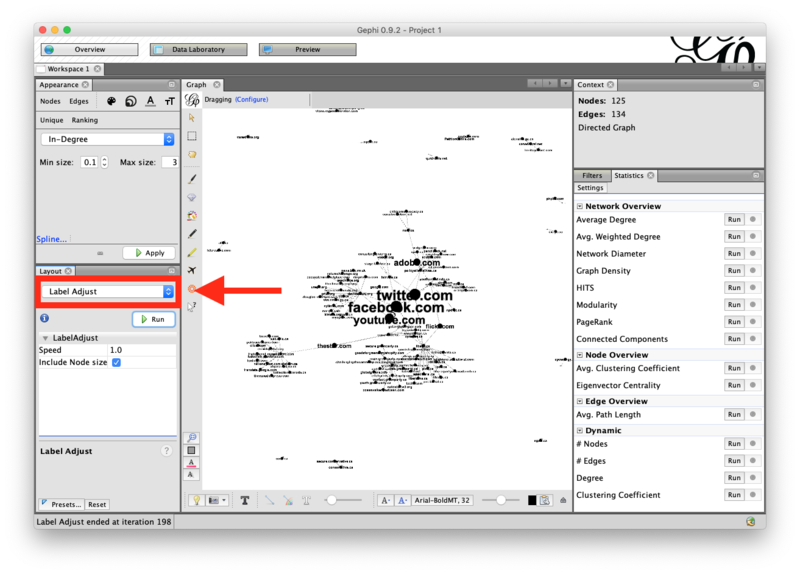 Let’s extract all of the links from the sample data and export them to a file format that the popular network analysis program Gephi can use. By now this should be seeming pretty straightforward! (remember to keep using :paste to enter this code). 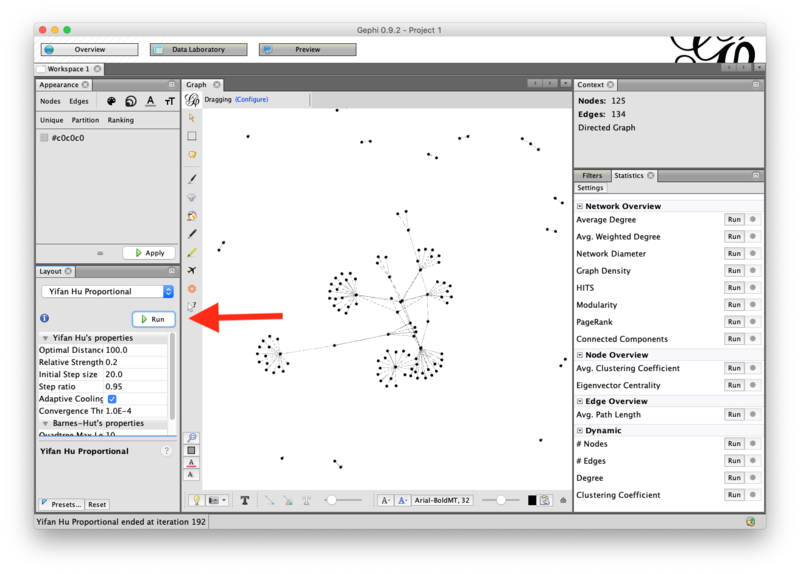 The first step should be to work with this network diagram so you can make a beautiful visualization yourself. You should now download and install Gephi, which you can find here. 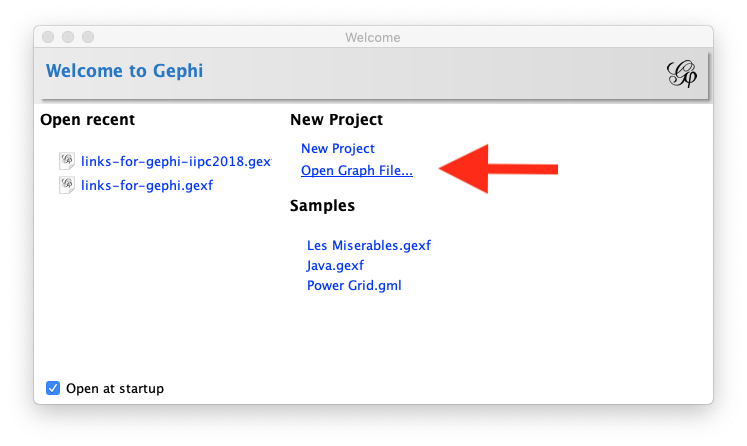 Upon opening the Gephi application, you want to select “Open a Graph File…” and select the links-for-gephi.gexf file that you generated in the last script. It will be found in the /data directory you have been working with. You then want to click ‘ok’ on the next page. 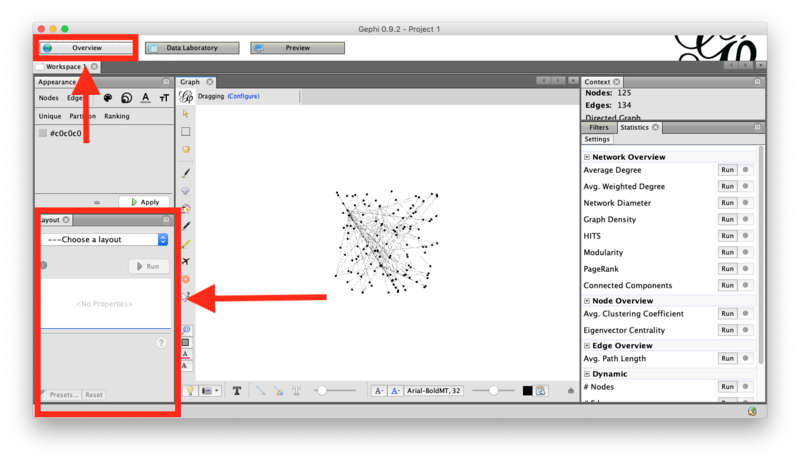 You can see in the sample data that you have a network with 125 nodes (or domains) with 200 edges (or links between those domains). Select the layout tab at left, and select “Yifan Hu Proportional.” Leave the values default, but you can begin to play with the figures and see what it does. To lay the graph out, click the “run” button. The following image shows what this looks like after clicking “run” on the default visualization. Let’s add some labels so we can see what this all means. Click on the “T” button below the graph, which is highlighted below. You’ll then see lots of labels. It is not too readable - don’t worry, we will deal with that shortly. The next step is to resize the nodes (domains) based on a characteristic. Let’s make them bigger based on how many times they are linked to. 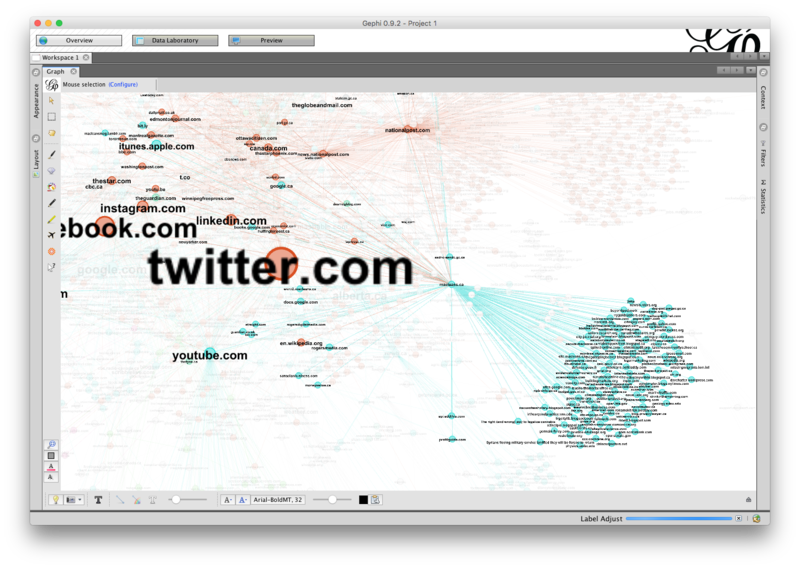 This is called “in-degree” in Gephi. If the above is confusing, look at the screenshot below and try to reproduce what you see there. Now let’s do the same for label size: the bigger the label, the more it is linked to; the smaller the label, the less it is linked to. You then want to click on the “text size” icon, select “Ranking,” and then select “In-Degree.” Let’s do a min size of 0.1 and a max size of 3. If this is confusing, again try to recreate what you see in the screenshot below. Some of the labels now overlap, so let’s run another simple “layout.” This time, we select “Label Adjust” and press run. Now let’s run a statistical analysis. We’ll run a rudimentary community detection algorithm. We can find that in the “statistics” section on the right hand side. 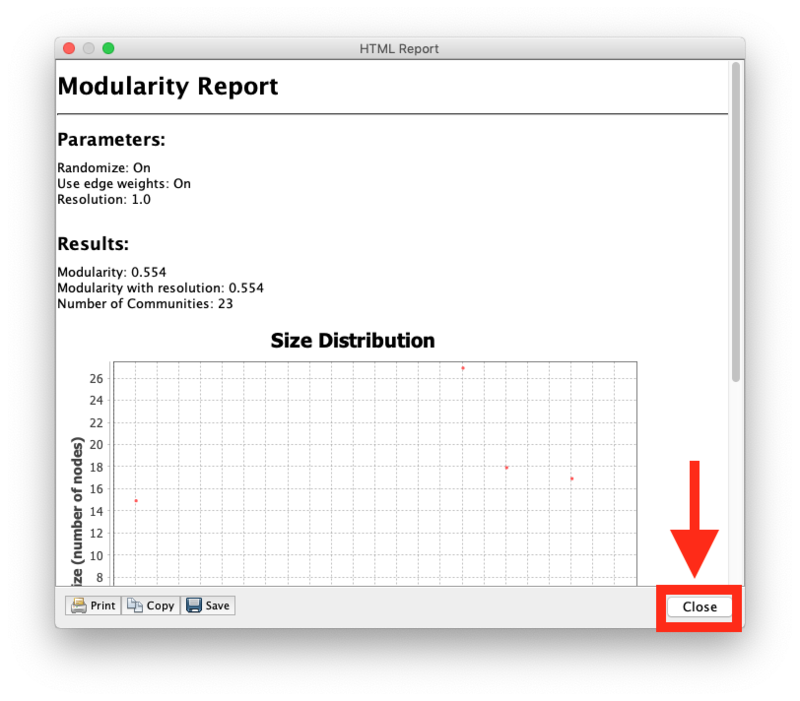 Click the “run” button next to modularity, and click through the next report. The two following screenshots show you where to look. The final step is to apply the modularity categories to the graph. Let’s colour the nodes based on the community that they appear in. To do so, go back to apperance. This time click the painter’s palette, select “Partition,” and then apply “Modularity Class.” As before, try to recreate what you see in the screenshot below if it is confusing. Hazzah, now you have a nicely-laid out graph. Try experimenting with other features in Gephi now. 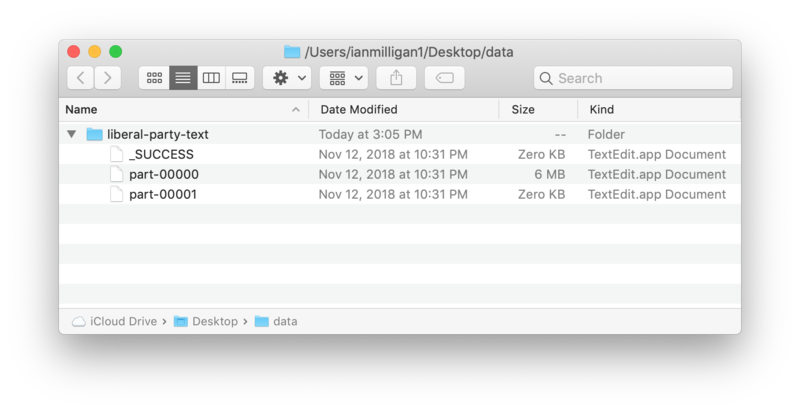 Filtering the Full-Text Derivative File: This tutorial explores the use of the “grep” command line tool to filter out dates, domains, and keywords from plain text. 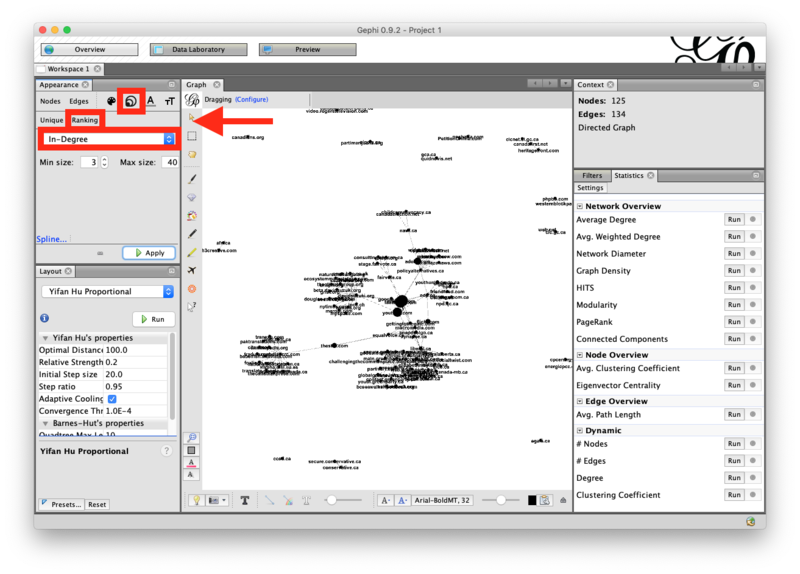 Text Analysis Part One: Beyond the Keyword Search: Using AntConc: This tutorial explores how you can explore text within a web archive using the AntConc tool. Text Analysis Part Two: Sentiment Analysis With the Natural Language Toolkit: This tutorial explores how you can calculate the positivity or negativity (in an emotional sense) of web archive text. Good luck and thanks for joining us on this lesson plan. The ARC and WARC file are drawn from the Canadian Political Parties & Political Interest Groups Archive-It Collection, collected by the University of Toronto. We are grateful that they’ve provided this material to us. You can find more information about this collection at WebArchives.ca. This work is primarily supported by the Andrew W. Mellon Foundation. Other financial and in-kind support comes from the Social Sciences and Humanities Research Council, Compute Canada, the Ontario Ministry of Research, Innovation, and Science, York University Libraries, Start Smart Labs, and the Faculty of Arts and David R. Cheriton School of Computer Science at the University of Waterloo.